After graduating from the “N. Paganini”conservatory in Genoa, where he studied under the guidance of Nevio Zanardi, Giovanni Scaglione attended some master classes held by Michael Flaksman and Antonio Meneses. In 1997 he enrolled at the Musikhocschule in Basel, in order to study under Ivan Monighetti and gaining his role in Monighetti’s Konzert Class. After studying there for four years, he had the chance to play with musicians like Sergio Azzolini and Gidon Kremer. He graduated with honours (getting the prestigious Solisten-Diplom) after demonstrating his skills by playing the Concert for cello and orchestra by Schumann with the Basel Symphony Orchestra. In 2001, he won the audition organized by CIDIM and became a member of the “Boccherini” sextet. Together with the other members of the sextet, he could play for the most important concert societies in Italy, as Amici della Musica di Firenze, Amici della Musica di Palermo, Amici della Musica di Perugia, Unione Musicale di Torino. At the same time, he also attended some courses held in Brescia by Mario Brunello and others at Accademia Stauffer in Cremona held by Rocco Filippini. Later on, Filippini and Salvatore Accardo asked him to collaborate with them for the chamber music concerts at Teatro Olimpico in Vicenza. In 2002, he became one of the members of Quartetto di Cremona. Internationally renowned for their “extremely mature and lyrical sound” (Strad), the Quartetto di Cremona now graces the stages of the most prestigious venues. Their focus and intensity brings life to music from the “tight blend and immaculate voicing” of their Brahms to the “sleek and elegant” dynamic contouring of their Mozart (Strad). The Quartetto di Cremona formed at the Stauffer Academy in Cremona and continued their studies with Hatto Beyerle. In 2005 the Quartetto di Cremona received a Borletti-Buitoni Trust Fellowship. Building on their early successes, the Quartetto di Cremona has played to critical acclaim at the most important venues and festivals in Europe including at the Beethoven Haus and BeethovenFest Bonn, Konzerthaus (Berlin), Klara Festival (Brussels), Mecklenberg Vorpommen Music Festival, Båstad Chamber Music Festival, Turku Music Festival, Handelsbeurs (Gent), Moving on Music Festival (Northern Ireland, recorded by BBC Radio 3), and numerous performances at the Wigmore Hall (London). The Quartetto di Cremona has toured extensively in Australia and performed at the renowned Perth International Art Festival Australia. In the USA, they recently won the eleventh Web Concert Hall Competition and they performed at Metropolitan Museum in March 2013. In their homeland of Italy they have made their name performing at the Accademia di S. Cecilia in Rome and at the most renowned Italian music societies. The Quartet was nominated “Artist in Residence” at the Società del Quartetto of Milan and will be involved in various projects culminating in 2014 for the 150th anniversary of the Società del Quartetto – when they will perform the complete cycle of Beethoven quartets. Recent and forthcoming tours include engagements in the USA, Japan, Mexico and China and in Europe the Quartetto di Cremona will tour the UK, Italy, Scandinavia, Germany, and make a debut tour of Austria. Their debut recording for Decca encompassed the complete string quartets by Fabio Vacchi, released in April 2011. From July 2012 over the next two seasons the Quartetto di Cremona is recording the complete Beethoven String Quartets for the German label Audite, which also issued Italian Journey, dedicated to Italian composers, in November 2012. An important part of the Quartetto di Cremona’s activity is teaching master classes throughout Europe. Since Autumn 2011, the Quartet has taught at the Walter Stauffer Academy in Cremona (http://accademia.fondazionestauffer.eu). The Quartetto di Cremona has been chosen as a testimonial of the International project “Friends of Stradivari”. 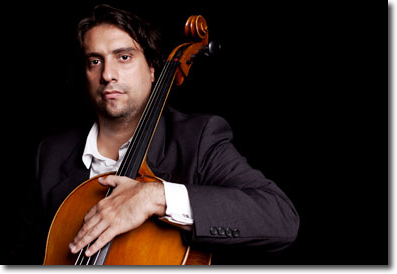 In May 2011 Giovanni Scaglione had his debut in a recital for cello solo at Quirinale in Rome, broadcasted live on the national channel Rai Radio 3. During the season 2013-2014 he performed in Milano – Società del Quartetto, Firenze – Amici della Musica, Messina – Filarmonica Laudamo, Roma – Accademia Filarmonica, Mantova – Chamber Music Festival, and in July 2014 he had his debut in a recital with Angela Hewitt at Trasimeno Music Festival. Since 2013 he teaches cello in Genoa, at ”Master for Strings”. He plays a Don Nicola Amati cello made in Bologna in 1712, kindly lent by Kulturfonds P.E. Eckes.